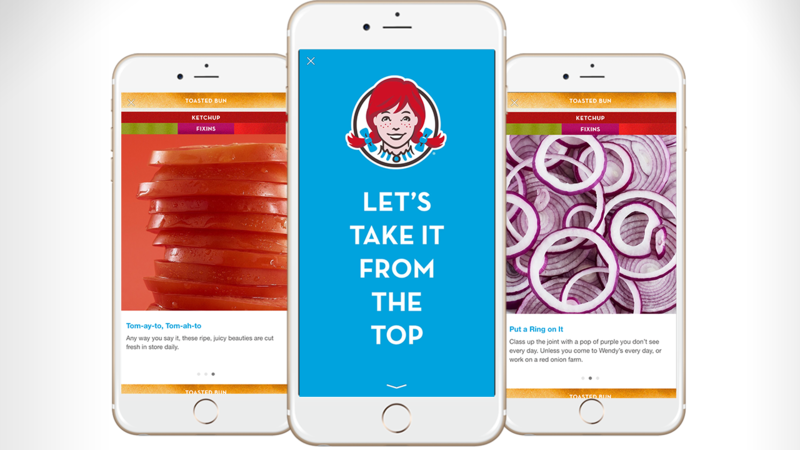 Brands are just starting to play with Facebook's full-screen mobile ads, but Wendy's social marketers already seem to be having lots of fun with the new format. The fast-food chain is running a campaign that uses a combination of photos, videos and GIFs to show how each layer of its hamburgers are made—like wavering pieces of cheese and a grilled beef patty. "The Wendy's quality story carries a lot of equity with our fans and we wanted to invite them into that story, literally layer by layer," said Mike Bueno, director, digital marketing at Wendy's. "We're always looking for new ways to have fun with digital, and Facebook is a great partner in helping us do that." The ad prompts folks to swipe up when clicked on from the news feed—a gesture that's core to Snapchat and its pitch to advertisers and publishers. It's another example of how brands are creating more vertical video and content for specific platforms. Other brands testing Facebook's new immersive ad format include Gatorade, Michael Kors and Bacardi. Take a look at the video and creative below.